EL = Ergonomic, Light: Swarovski Optik have used a magnesium alloy to make the main housing, which is light, strong, will not corrode and is generally considered better than the aluminium or polycarbonate ones often found. The first is that by having two anchor points at each end instead just one (usually in the middle or near the top) the barrels have less chance of becoming misaligned through any twisting. However most single bridge bins take this into account by making sure that the bridge is suitably strong enough. The next possible advantage is that it gives you a more secure area to hold your bins, especially one handed (illustrated by the image above right). If you always use a binocular harness this is not much of a factor. But even with a neck strap, there may be times where you don't want to or cant use a neck strap - for example you are negotiating difficult rocky terrain and you don't want your bins swinging from your neck where they could collide with a boulder or tree, being able to hold them securely in one hand, leaving the other free to support yourself is important. 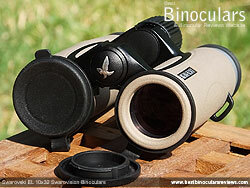 As with most binos, these EL Swarovision bins have a rubber armor coating that covers most of the housing,. 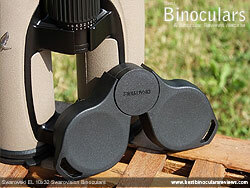 This helps to protect the optics inside and provides you with a more secure surface to hold onto. This rubber looks to be about 1mm thick and is very hard, which makes it a little less tacky and thus a little less "grippy" than some, but does make for a really good looking finish. As you can see from the photos I took for this review, the pair I was sent to test had what Swarovski Optik call a "Sandbrown" colored armor, but you can also get it in a dark Green colour if you wish. 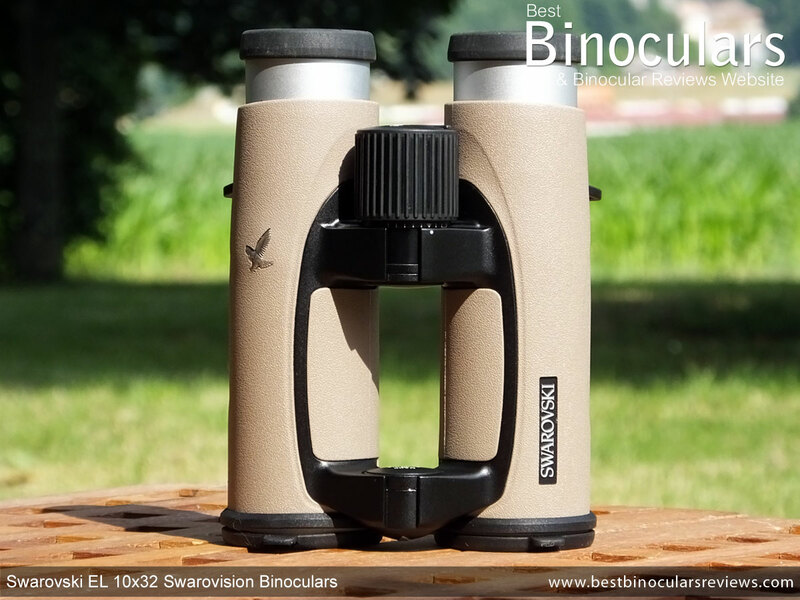 This sand/tan colored version is also sometimes referred to as the Swarovski EL Traveler 10x32 Binocular, but apart from the color, I am pretty sure there are no differences. When I announced on Facebook that I was reviewing this "Traveler" version, I received a question from a reader suggesting that this color would show dirt more easily. This is probably true, however with such a hard finish to the rubber, it really would not be difficult to wipe the barrels clean again. So in my opinion, apart from aesthetics there really is not much to choose between the two. On the underside of each barrel is a thumb indent, which are positioned well, doing just enough to encourage you to hold the bins correctly and make them perfectly balanced. The objective lenses are set approx 9mm within the ends of the barrels, which is reasonably deep compared to all the others I have measured and thus will help provide some protection from scratching, dust and moisture. I have also read that it can help prevent lens flare as it works a little like a lens hood used by photographers. As you would expect of every binocular in this class, the housing has been sealed and have been submersion tested to a depth of 4m (13ft). A fully sealed body also prevents any dust from being able to enter the system that could easily negatively affect the view. All the air inside the cavity has also been replaced with dry nitrogen gas, this moisture free environment stops corrosion as well as prevents the inside lens surfaces from fogging or steaming up. It is common for the eye-cup housing to be made from a plastic, however, on the EL binoculars it is most certainly metal and whilst this may add a few grams to the weight, it makes them far more hardy. Swarovski have then added a small amount of rubber padding to the ends of the metal casing, which gives them an external diameter of 38mm, which is around about average for this size of bin. However unlike the majority of bins that I have tested that usually have a fairly wide (around 6mm) rubber covered face on the ends of the eyecups, the ends of the eyecups on the Swarovski EL 32's are only 3mm wide. I would have thought that this could make them a little less comfortable, especially when pressed firmly against your face, but comparing them to a few others, the difference was really not noticeable. 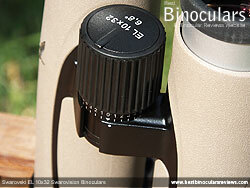 The mechanism of the twist-up helicoid eyecups is beautifully smooth and you get two fixed intermediate stops in-between fully extended and fully retracted which gives you a good amount of flexibility to get your eyes at the exactly the right distance behind the ocular lenses to get the optimal image without any dark haloes around the edges of the view. Of course most people who don't wear glasses will just fully extend the eyecups, but for those who wear glasses, the 20mm of eye-relief is excellent and you should easily be able to keep them on and still get the full field of view. I measured the max and min distances between the centers of the ocular lenses when fully opening and fully closing the central hinges as being 74mm - 54mm (2.9 - 2.2in), which is exactly the advertised distances. This range is excellent, especially the minimum of 54mm, which is a little narrower than many and so those with close set eyes, should be able to line up the lenses correctly. For more on this and for a few comparisons, take a look at my guide to interpupillary distances. The centrally located focusing wheel turns very smoothly and takes two complete revolutions (720°) to go from one end of the focusing plane to the other. This is a fairly low geared mechanism, which makes it a little easier to adjust the fine focus and get it spot on, but it does mean that it takes a little longer to get from near to far focus or vise versa. Unlike the metal eyecups, the wheel housing looks like it is made from plastic and has a thin rubber cover with deep grooves cut into it for a great non-slip surface. It's external diameter is 28mm, which is a little less than some, but the grooves, combined with a nicely prominent position mean that I found reaching and turning it very easy, even with my thick winter gloves on. Most bins have a ring around one of the barrels near the eyecup that is used to adjust the lenses independently so that you can calibrate the binoculars to compensate for any differences between your left and right eyes. However on these Swarovski EL 10x32 binoculars, the diopter adjustments are made by clicking out and turning the main focus wheel. Unlike the very smooth turning of the wheel during normal focusing, when you turn the wheel with the diopter adjustment engaged, there is a extremely fine ratchet and it turns with very satisfying light clicks. This works really well and I like the way you can lock it so that it should not accidentally get moved away from your setting. I also REALLY like the way Swarovski have included a scale on the diopter, making it easy to remember and return to your setting should it be changed either on purpose when sharing your bins or when moved accidentally. 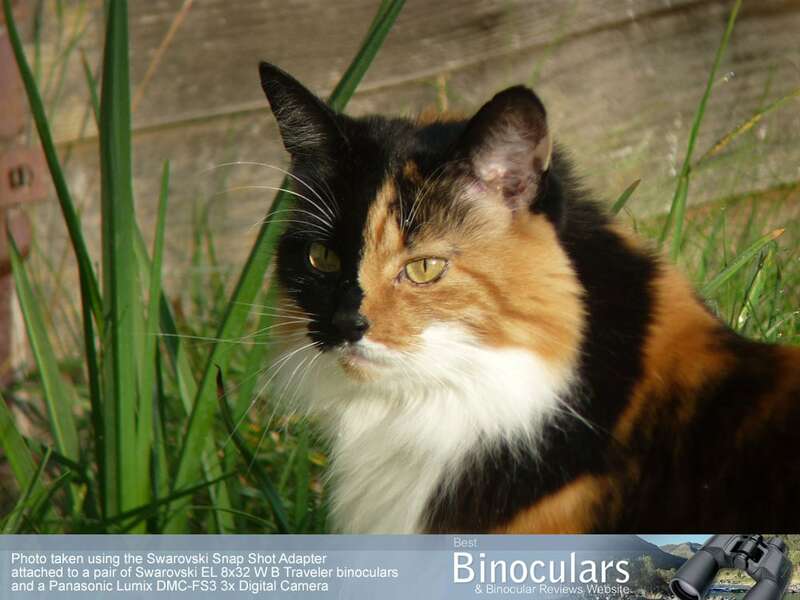 You will not believe how few binoculars have this, which to me is almost a no-brainer. If you are confused between the difference between normal focusing and the diopter adjustment, take a little time to read my article on how to correctly calibrate & focus your binoculars. The advertised dimensions are 13.8cm (5.3in) long x 11cm (4.3in) wide x 5.7cm (2.4in) high. I measured the length to be 13.7cm with both the lens covers removed and the eyecups fully twisted in. Adding the lens caps and rain-guard extends this length to 14.1cm and the twisting out the eyecups moves it out to 15.2cm. Their width I measured to be 10.5cm at the widest point when the hinge is fully closed, opening the hinge their width is 12.7cm according to my measurements. Fully closing the hinge, but with the objective lens covers on, I measured their height (depth) as 7.6cm, opening the hinge this reduces to 6.2cm. To get the advertised 5.7cm, you have to remove the lens covers. 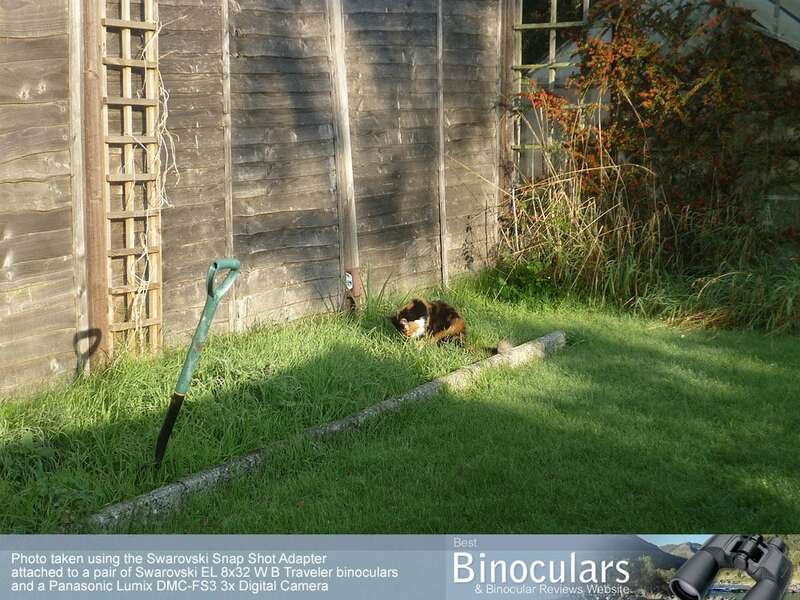 The diameter of the ocular is an impressive 24mm, which is way bigger than most other mid-sized binoculars that I have tested and indeed is on a par with many full-sized bins. 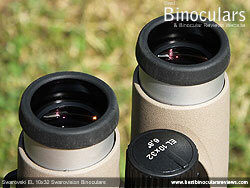 Another point of interest is the slightly more modest Swarovski 8x30 CL Companions have 18mm ocular lenses. 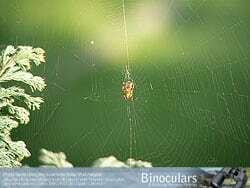 When you focus most binoculars on an object that sits at the center of the view, some of the area on the edges of the view may be slightly out of focus. Likewise focusing on an object at the edge of the view, often means that it may be slightly out of focus at the center. Thus what a field flattening lens does is to shift the focal points across the whole surface to lie in the same plane making the edge of the view and the center of the view come into focus at the same time to produce an image that looks sharp right across the field of view with less distortion. Swarovski have a nice graphic which I have added on the right to illustrate this. As I said, having these "field flatteners" is very impressive because only a small percentage of the very best binoculars use this in their lenses. 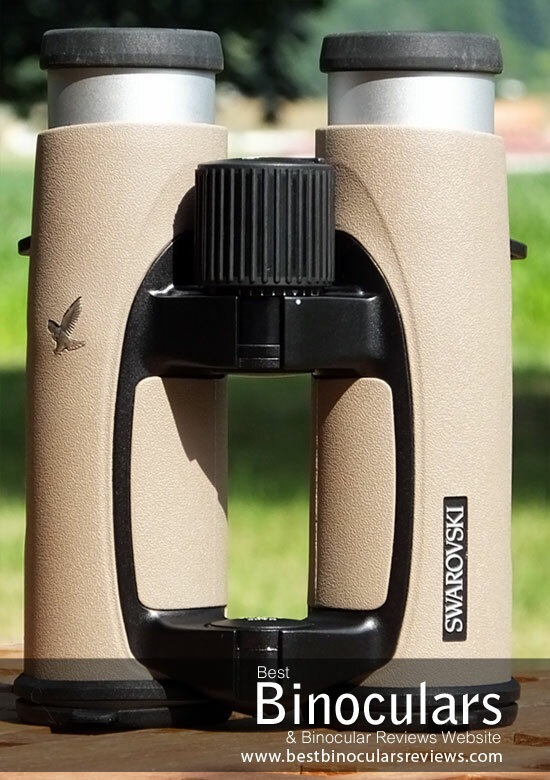 The multi-element objective lenses on these Swarovski 10x32 EL Swarovision binoculars contains one element that has fluoride-containing HD (High Density) extra-low dispersion glass. Using a high density glass has a number of advantages: It is easier to work with and thus the optical designers are better able to direct the wavelengths of light for a better image. Higher density glass also expands and contracts less with temperature changes, which ensures that the properties of the lens and their ability to perfectly direct light are less affected by temperature. Swarovski use Fluoride ions dispersed throughout one of the elements in their lenses as a way of reducing the light dispersion. This in turn allows them to be able to control the wavelengths of light better, reducing the chromatic aberration and thus potentially produce an image that is sharper and with less or no color fringing. I would just like to quickly mention that Fluoride containing glass is just one way for manufacturers to make a lens with extra low dispersion properties and that there are other ways, including multiple, complex glass elements made from ordinary flint and crown glass combinations can also be used to produce ED lenses. What I am not sure of is which is the best method as it takes more than just using ED glass in the objective lenses to reduce color fringing. But what I can say is that it seems the "best binoculars" like these and the top spec Zeiss Victory HT binoculars for example use Fluoride, whilst cheaper ED binds do not. 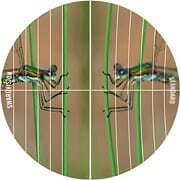 For more information on ED glass and how it gets rid of color fringing take a moment to read my guide to ED glass on binoculars. 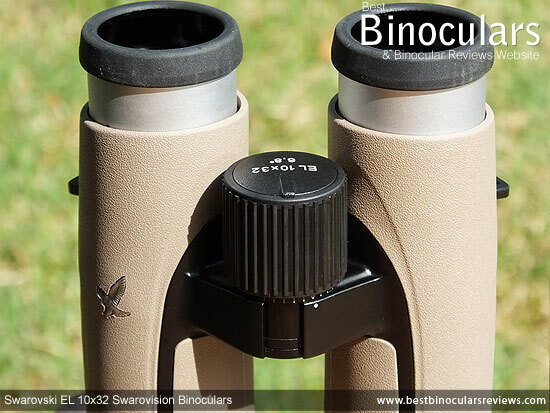 All Swarovski Optik binoculars, including these EL 10x32's are fully coated with their patented Swarotop & Swarodur coatings. These are essentially their own cocktail of multi-layered, wide-band anti-reflection coatings that are designed to minimize unwanted reflections from the surfaces of their lenses. So what does this mean for us and why is it important? Well as light hits the surface of the lens, some of it gets reflected away, potentially causing unwanted effects like lens flair and reducing the amount of light traveling through the optical system and thus adversely effects the image quality and brightness. 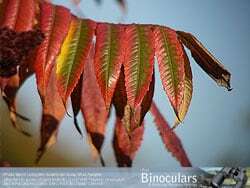 So to reduce the amount of light reflected away almost every decent quality binocular uses some sort of anti-reflection coating(s) on the lens surfaces. However, not all are created equal and to save costs some use a single layer on all or even just some of the air-to-glass lens surfaces. As you would expect with a bin in this class, Swarovski apply numerous layers of at least one of their Swarotop and Swarodur coatings to each and every air to glass lens surface and they claim by using these they can reduce the surface light reflection from a level between 4 and 6% to an impressive 0.2% and they say also give a "noticeably better colour reproduction". The outer lens surfaces have also had their Swaroclean Lens coating applied to them. This is a non-stick coating designed to make cleaning your lenses easier. This initially may not sound like a big deal, but remember making it easier to clean away stuff like oil, dirt and water marks from your lenses means you have to apply less pressure when you do it, which in turn means you have a far lesser chance of scratching the glass and it's coatings, ensuring the last a whole lot longer in a perfect condition. As the light reflects off the surfaces of the glass on the roof prism, it diverges into two slightly out-of-phase beams of light. This is known as "phase shift" and left uncorrected produces a lower resolution image with less contrast. To correct this, the best optics add phase correction coatings to a surface on the prism and Swarovski call this their P-Coating which is used on this EL Swarovision series. The next drawback to a roof prism is that one of the surfaces does not reflect all of the light that hits it and so left uncorrected, less light gets through the optical system and onto your eyes. To improve the amount of light reflected manufacturers add highly reflective coatings to this surface. The cheapest way of doing this is to add a mirror coating made from aluminium which has a reflectivity approx 87% - 93%. Silver mirror coatings cost more, but can improve this reflectivity to about 95% -98%, but can result in the images having a slightly yellow tinge to them. 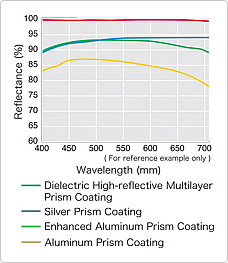 Then at the very top you get dielectric prism coatings that boost the reflectivity to more than 99% across the entire light spectrum and so not only are images brighter, but have a much more natural appearance (true color fidelity). To my knowledge this is pretty much what Swarovski use on the EL series, but which they call their Swarobright coatings. Indeed I think it was Swarovski Optik that invented the elaborate and expensive process of adding a large (over thirty) layers of dielectric material that are tremendously thin to create a mirror on the prism which dramatically increases the amount of light transmitted. Swarovski Optik advertise the close focus as being 1.9m (6.2ft) - however I measured it as being even closer at 1.66m (5.4) on the pair I was using, which is excellent, making these a great choice if you also sometimes looking at things like flowers and insects and even birds from close range. At 20mm the amount of eye-relief is once again excellent and means that they are a great choice if you wear eyeglasses and want to use them whilst binning. 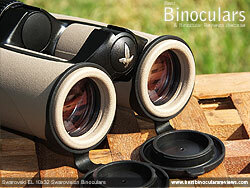 It also means that these Swarovski binoculars easily make it onto my list of bins with a long eye-relief (over 16mm). So how does all this fantastic craftsmanship and the highest spec optical components and coatings translate to the characteristics and overall quality of the image produced? 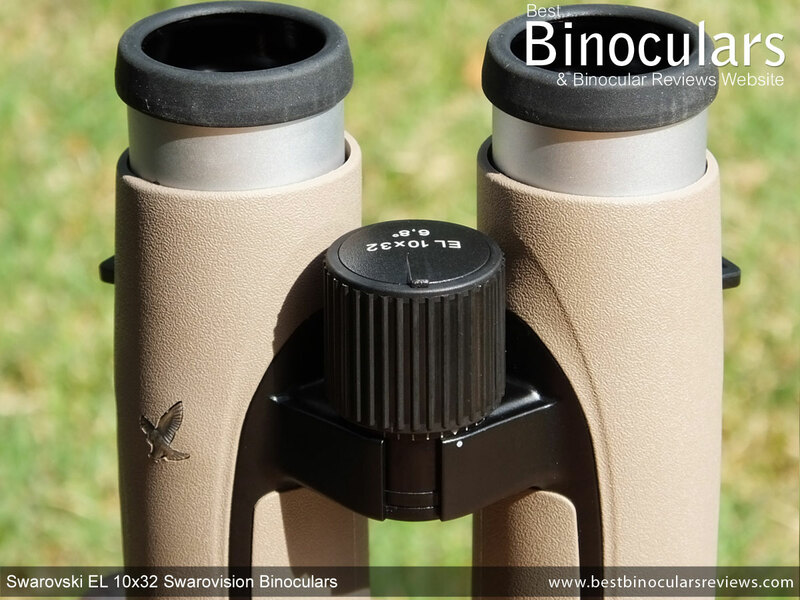 Well it would be very easy for me to just say that the view through them is superb, but to try and be as objective as possible I compared different aspects of the view through the Swarovski EL 10x32 Swarovision binoculars with that of a number of what I call my "benchmark" binoculars which is what I do with all my reviews. It is in this way, over time and with more and more experience I have been able to position these aspects of the view in comparison to my benchmarks and thus am able to give then a comparative rank against each other. I carried out these tests twice, the fist time was in the middle of the day with good light and once again later on, just before and just after sunset as the light went from poor to very bad. Not only is the image flat and in focus right across the field of view, but there is almost no softening at all on the edges. 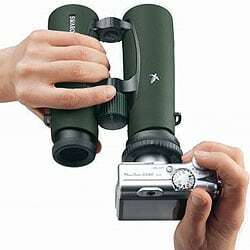 Definitely better than just about every binocular I have ever used and way better than any of my control bins. To look for any signs of color fringing, my method is to focus on the edges of objects that contrast highly with their background. If the amount of color fringing is bad, you can clearly observe a blurry red/yellow or sometimes purple halo around the object edges, but on these, try as I might, I really could not notice any. Image contrast was to my eyes excellent making for an image that is full of depth and allowing highly contrasting objects like birds in trees to almost jump out at you. The colors that are produced are very vibrant, which may be accentuated because of how bright the image is, but yet they still look completely natural without any hint of an artificial tint. All 10x32 binoculars have a 3.2mm exit pupil (32 ÷ 10 = 3.2mm), this is wide enough for them to provide your eyes with more than enough light when ambient light is good and the pupil in your eyes is dilated to around 3mm in diameter. This is why, unless you are using a really poor quality binocular, image brightness will appear to be very similar when comparing a wide range of bins in good light. It is when the ambient light is poor or even bad and your pupils in your eyes dilate to a size larger than the exit pupil that you can really start to notice the differences in image brightness. For a complete explanation, please read my complete guide to the exit pupil. In very poor light, I first compared these 10x32 EL's against my 8x32 controls that have a larger 4mm exit pupil and so had all else been equal they should have seemed brighter, but they did not, in fact the opposite was true. 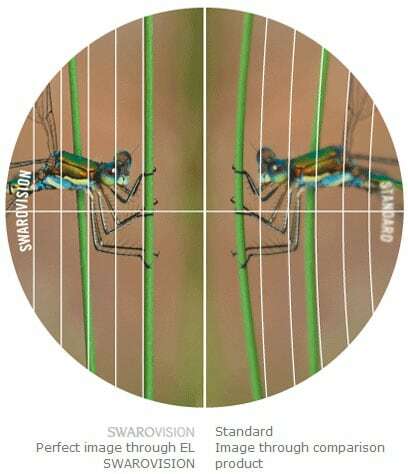 This is because of the superior quality optics and coatings used on the Swarovski EL 10x32 that allows more light to be transmitted to your eyes. In fact these Swarovski EL's were brighter than even my mid level 8x42 binoculars that have a much larger 5.25mm exit pupil, which is really very impressive. The depth of field is also very good and from my test and based on past experiences is better than many 10x binoculars I have used. The method I use to test for their depth of view is to focus on an object at around 5 meters away and then move my view backwards without changing the focus wheel until the view is out of focus. I then compared this distance with my benchmark 8 and 10x binoculars. The soft carry case seems to be made to a high standard and is well padded. The tightly woven nylon type material as well as what looks like some sections made from Neoprene will also keep light rain from getting through and so for a soft case this one does a good job of protecting your investment. The binoculars fit snugly inside, without being too tight meaning that they can be stored with their lens and rainguard attached and the eyecups fully extended, something that is sometimes overlooked. The lid is held closed with a plastic clip that works well enough, but can at times be a little awkward to open. It is also much better than the commonly used Velcro fasteners, that makes too much noise for my liking, frightening away birds as you take your bins out the bag! The bag has it's own carry strap and also has a small pocket on the front, that can be used to store objects like a cloth and other lens cleaning gear. On the rear of the bag they have sewn a loop that you can use to thread your belt through. Exceedingly well made and with plenty of padding (5mm deep) the neck strap is one of the best I have ever used. The padded section is is 1.6in (4.1cm) wide and is curved and shaped so that it fits perfectly around your neck and shoulders making it very comfortable. I love what I call the lockable quick release length adjustment tab that connects the tin cord to the padded section that is very neat and makes adjusting the length of the strap very simple. Definitely the best I have ever used. Made from a semi-flexible rubber the objective lens covers fit over the ends of the barrels. 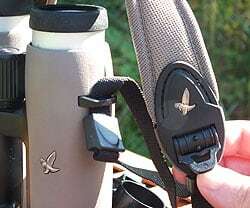 They are also tethered to the binocular via a rubber loop that fits around the barrel. This ensures that the lens cap is always handy and quick to replace once you have finished using your bins. Whilst these work well enough, I have seen a slightly neater, more streamlined solution on binoculars like the Celestron Granites where the cap fits inside the ends of the barrels and is attached to the body with a small clip rather than a loop. The ocular lens cover, or rain-guard as it is sometimes called is excellent. Made from a plastic, it fits over the objective lenses with just enough friction to keep them in place and prevent them accidentally coming loose. There is also a loop on the end of each cup that you can use to thread the neck strap though should you wish. Rather than just a flexible soft plastic or rubber bridge between the two cups that most guards have, this has a central hinge between the two cups that can open and close to allow for the different distances between the two eyecups, depending on your inter-pupillary setting. Surprisingly this is frequently overlooked and you have to change your desired setting every time you wish to store your bins and whilst this may only be a very small point, it does demonstrate a great attention to the small details. 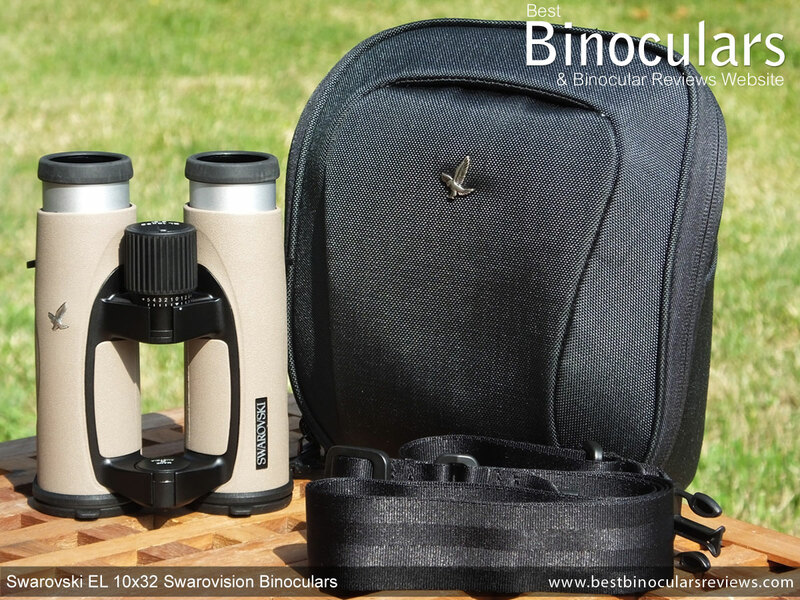 The Swarovski Snap Shot Adapter that is included with these EL binoculars effectively creates a telephoto camera lens for your compact camera as it allows you to connect it to the right eyepiece of the bin. Most compact digital cameras that have a 4x optical zoom or less and extendable objective lens are compatible. Whilst I did not have a suitable compact with me during the time I was testing this model, I have tested the snapshot adapter before when I reviewed the 8x32 EL's with a now somewhat outdated Panasonic Lumix DMC-FS3 camera and I was really quite surprised and impressed by the results. I found that it was a little tricky to get a pin sharp image, especially when focusing on objects that were close to me. However it is possible and as you would expect with any telephoto lens, you need to keep your hands as steady as possible to prevent camera shake and the subsequent blurring of the image. The photo below right of my cat was taken just using the camera (1x zoom), without using the snapshot adapter and to show what difference it makes, I took the second photo below from the same position using the snapshot adapter and the 8x El Traveller Binoculars - I also used the 3x zoom on the camera, giving at total of 24x zoom - pretty impressive! It is fairly common for a binocular to come with a reasonably good cleaning cloth. But the micro-fiber cloth that comes with these EL's is excellent and what is more, you also get a disposable, moistened cleaning tissue for the lenses. Once you have used this, I would highly suggest getting a professional optic lens cleaning kit to properly look after your investment. The included booklet is fairly comprehensive and includes details on how to set up, focus, look after and clean the binos. It also contains a separate sheet with all the main specifications. The warranty card is attached to the back cover of the instruction booklet: Swarovski offers a worldwide 10 year warranty for all bins in the EL range. Strong Points: In keeping with what you expect from Swarovski, the build quality and the quality of the components they use to make the bin is pretty much as good as it gets. 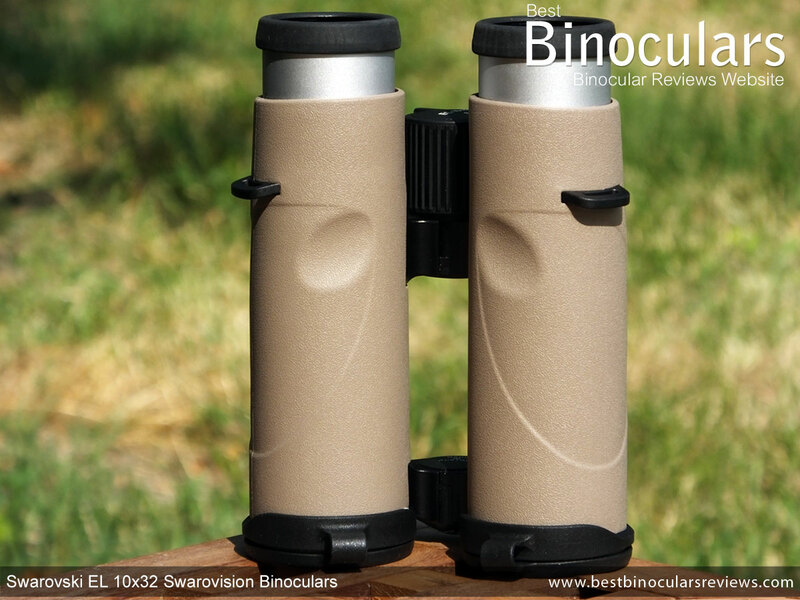 For a 10x binocular, these have a really wide FOV, but what is even more impressive is that at the same time as this wide FOV, you get plenty of eye-relief and a completely flat and in focus image from the center, right to the edges of the view. The image is superb and is as good and as bright as any other 32mm binocular that I have ever had the pleasure to look through. These really as up there with the very, very best. Weak points? Apart from what is currently physically, technically and optically impossible to achieve, I really cannot think of any weaknesses worth mentioning. There may be a few aspects that some may not like, for example you may not like the color, but this is a personal opinion and to be fair you can also get it in green anyway! Perhaps in a magical world these would cost a whole lot less and whilst it is probably true that to some extent that you are paying a little for the name, but having said that, by investing in the name you can be 100% sure that you are getting the very best product, made to the highest standards with the best components and one that is backed by a guarantee that proves the company believes in what they are supplying you with. At their current retail price, the sit within my Premium/Expensive price category (approx: >$1200 / >�1200). It is almost impossible to be fair to either when trying to compare the value for money of a cheap or mid priced binocular to these as they are just so different. So what I have done is to make a number of different price ranges and compare the value for money of a binocular within that range. 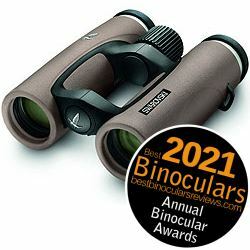 So within their price bracket, they needed to have scored at least 92% on the Best Binocular Reviews Ratings scale to be considered good value, which as you can see below they easily achieved and so that is why within their category and compared to others in this same category that score less than this, I consider these to be better value for money. Ideal Uses: I think with these superior optics, it is almost a case of trying to figure out where they would not be ideal! They are simply perfect as travel and in particular safari binoculars as well as perfect, camping and hunting binoculars in situations where size and weight are important, especially if you need to carry all your gear. 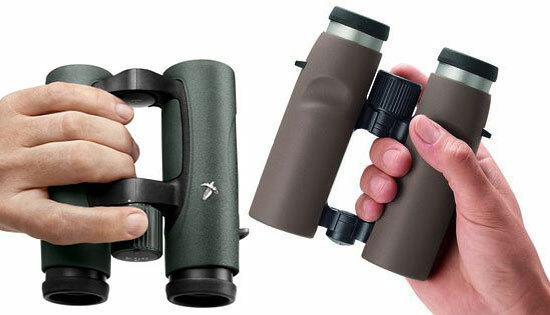 They make perfect birding binoculars where size, weight and a slightly higher power and more image detail is important and the FOV is a little less important, for example in wide open areas like fields, around lakes or at the coast. If however your birding is in darker forests and from closer ranges, you may be better off with the wider FOV on the 8x32 EL. I would like to thank Swarovski Optik for sending me these binoculars to test and review. 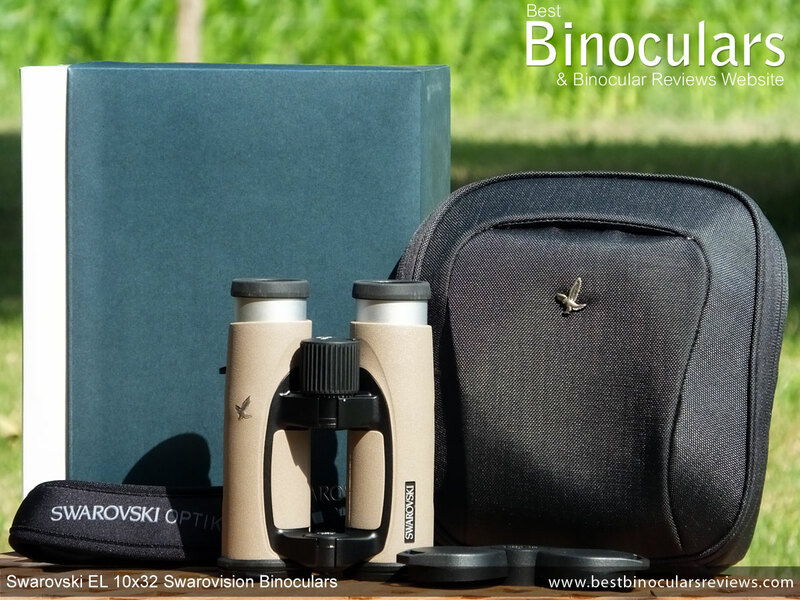 It is also important for me to make it clear that unlike some "binocular reviews" that I see on the web that are little more than advertisements based on the manufacturers information written by people who have never touched the binocular in question, this Swarovski review as indeed all the other ones on BBR is 100% genuine and is my honest opinion of the binocular after using and testing them in real world conditions. The views I express are my own and the information I give is to the best of my knowledge.